As part of the celebration of Mayberry Days 2002, the SURRY ARTS COUNCIL and major sponsor CONSUMER CONCEPTS are pleased to announce a fund-raiser raffle for an EXCLUSIVE, PRIVATE DINNER FOR TWO WITH "ANDY GRIFFITH SHOW" STARS WHO ARE ATTENDING MAYBERRY DAYS. The catered dinner will be on Saturday, Sept. 28, in the childhood residence of Andy Griffith. As a bonus, a LIMITED EDITION MAYBERRY SQUAD CAR COOKIE JAR AUTOGRAPHED BY THE MAYBERRY DAYS STARS will be included in the Raffle prize. So even if you know you cannot attend the dinner in Mount Airy, you could still win the autographed cookie jar. Win or lose and whether you attend or not, you'll be helping support Mayberry Days. Among the stars expected to be at the dinner are BETTY LYNN (Thelma Lou), HOWARD MORRIS (Ernest T. Bass), MAGGIE MANCUSO (Charlene Darling), DOUG DILLARD (Doug Darling), and GEORGE SPENCE (Frank the Boyfriend). One or two more stars may be added to the guest list between now and the drawing. The Raffle tickets for the special Dinner are $10.00 each and may be purchased with Visa/MasterCard through the Surry Arts Council by phone at (336) 786-7998. Orders with Visa/MasterCard or checks made payable to Surry Arts Council may be mailed to Surry Arts Council, P.O. Box 141, Mount Airy, NC 27030. TICKETS MAY ALSO BE ORDERED ONLINE THROUGH WEAVER'S DEPT STORE AT http://iMayberry.com. Or you can order Raffle tickets Mon.-Sat. at the Weaver's Dept. Store toll-free order line at 1-877-943-9439. Raffle tickets may also be purchased in person at the Andy Griffith Playhouse, at 218 Rockford Street in Mount Airy up until the time of the drawing. Another way to order: Send a check payable to TAGSRWC, 9 Music Square South, PMB 146, Nashville TN 37203. No matter where or how you order, the charge is $10 for each Raffle ticket you desire to purchase. With each ticket order, be sure to include the following information: Entrant's name, mailing address, phone number, and e-mail if available. Also indicate whether the Entrant plans to attend Mayberry Days and the location and phone number where the Entrant can be reached during Mayberry Days, if known. PHONE, MAIL AND ONLINE ORDERS MUST BE RECEIVED BY SEPTEMBER 15, 2002, in order to allow time for the mailing of Raffle receipts to those who have ordered. Tickets will continue to be sold in person at the Andy Griffith Playhouse (and possibly other Mount Airy locations) until the time of the DRAWING ON THE PLAYHOUSE GROUNDS AT 1 P.M. ON SATURDAY, SEPT. 28. 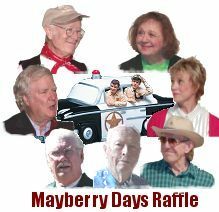 If the Winner has tickets to other Mayberry Days events that conflict with the Dinner, the Winner will have the option to be reimbursed for the face value of those unused tickets. ALL PROFITS FROM THIS RAFFLE BENEFIT THE SURRY ARTS COUNCIL AND ITS EFFORTS TO HOST THE ANNUAL MAYBERRY DAYS FESTIVAL. This Raffle is valid only where not prohibited. This will be a critical fund-raiser in helping the Surry Arts Council make ends meet as it puts on Mayberry Days for us fans. If you've ever wondered what you could do to help out with Mayberry Days or any Mayberry event, here's your chance. By simply buying a ticket (and encouraging others to do so), you'll be offering important, direct assistance to Mayberry Days. And who knows, you just might win that autographed cookie jar and, if you're attending Mayberry Days, a private dinner with the stars! * Aug. 22-24: DAVID BROWNING sets up his roadblock at the Bristol Motor Speedway. * Aug. 24 and 25: First Annual Stars of the Zone Convention at the Beverly Garland Holiday Inn in North Hollywood, Calif. It's a "Twilight Zone" event, but stars with Mayberry connections are expected to include AMZIE STRICKLAND, JEAN CARSON, HOWARD MORRIS, JAMES BEST, RUTA LEE, BARBARA STUART, WILLIAM SCHALLERT, MORGAN BRITTANY and BILL ERWIN, plus writer BRUCE HOWARD. For more information, visit http://www.twilightzone.org. * Sept. 21: DAVID BROWNING is at the core of the Boones Mill (Va.) Apple Festival. * Sept. 26-29: 13TH ANNUAL MAYBERRY DAYS in Mount Airy, N.C.
* Sept. 28: DON KNOTTS and Tim Conway perform at the Horseshoe Casino Hotel in Tunica, Miss. For info, call 1-800-303-7463. * Oct. 16: DEDICATION OF ANDY GRIFFITH PARKWAY in Mount Airy, N.C.
* Oct. 26: DON KNOTTS and Tim Conway bring their two-man show to the Alabama Theatre in Myrtle Beach, S.C., for two shows. (This is a rescheduled date from June.) For tickets or more information, call 1-800-342-2262. Again, check the Events Calendar at http://www.tagsrwc.com for more information and updates. "Great Work, Barn!" Oxford, N.C.
411 Elm Street				Pflugerville, Tex. Wally's Front Porch			Wilson, N.C.
"September 23, 1941, at 2:00 p.m."		Milton, Del. The Gomer Call (Hoot, Hoot, Hootie Hoot)	Charleston, W.V. The Williams House				Pembroke Pines, Fla.
"Sam's Planting a Little Happy Weed"	Parkersburg, W.V. "Fine, Just Fine" 				Coolidge, Ariz.
And a selection of our most popular items is available at 9 Music Square South in Nashville, Tenn., Mon.-Fri., from 9:30 a.m. to 5:30 p.m. (we are set up only for check or cash sales at this location). 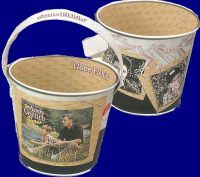 * MINI MAYBERRY TIN PAIL ($5.00) NEW! This brand new item is really fun. It measures almost 4 inches high and a little over 4 inches in diameter at the opening. It features a color photo of Andy and Opie fishing for Old Sam and photos of Gomer and Barney pioneering in "Back to Nature." The pail is perfect for pens and pencils or paper clips (you can pretend they're fish hooks). Or better yet, use it for candy or other treats! Opie might use his for carrying fishin' worms. Aunt Bee thinks it makes a nice planter for flowers. Ernest T. uses his for sizing his rocks-a snug fit in the pail means the rock is perfect for throwing. Otis uses his for measuring favorite beverages. In any case, it's a decorative, useful and nicely-priced new item. * MAYBERRY BASEBALL SCRIPT T-SHIRT ($15.00) NEW! The nostalgic baseball-style design says "Mayberry" in yellow-and blue script. It's available in sizes M, L, XL and 2XL. * I'M PROUD TO CALL YOU MY FRIEND ($10.00) NEW! This is a brand new book of Mayberry dialogue and quotations that deal with Friendship. The book is 64 pages, 6 x 6 inches in size, colorfully designed and filled with photos of favorite Mayberry moments. The perfect gift for (or from!) a friend. * ACT LIKE SOMEBODY ($10.00) NEW! This is the companion book to I'M PROUD TO CALL YOU MY FRIEND. It's the same size and format, but the theme is Parenting and contains favorite moments of Andy instructing Opie (and vice versa). And Barney and others throw their two cents' worth in as well. * MEMOIRS OF A COMPOSER NOBODY EVER HEARD OF BY EARLE HAGEN. (336 pages; hardcover with autographed bookplate: $38.00; soft-cover with autographed bookplate: $28.00:). All of our copies have autographed bookplates that are an exclusive of Weaver's and TAGSRWC. The "Fishin' Hole"-related design for the bookplates was rendered by artist Mike Johnson and then each was personally signed by Earle. There will be a maximum of just 400 books with the signed bookplates available. The book is special just on its own, but with the signed, limited-edition bookplates, it makes for a real Mayberry keepsake. We're delighted to be able to make this special offer to TAGSRWC members. * THE ENCYCLOPEDIA OF TV PETS ($20.00) We're not lion. This brand new, 322-page paperback has the top dogs (and pigs and dolphins and birds and monkeys and, of course, of course, horses) in the history of TV. It's the cat's! Animals from more than 100 TV shows (including a chapter on "The Andy Griffith Show") and commercials are featured in 320 pages with more than 200 photos. Includes new interviews with actors, owners and trainers. Fascinating stories and facts, many published here for the first time. Actors with Mayberry ties who are interviewed in the book include George Lindsey, James Best, Mary Grace Canfield, Barbara Perry and Rockne Tarkington.) We give it our seal of approval-aar-aar-aar! * COMICAL CO-STARS OF TELEVISION: FROM ED NORTON TO KRAMER by Robert Pegg (374-page paperback : $42.00, regularly $45.00) Most television historians agree that the popular co-star/second banana was born in 1955 when Art Carney, as Ed Norton, first addressed Jackie Gleason with a "Hey, Ralphie-boy," on "The Honeymooners." The phenomenon has proved to be one of the most enduring achievements of the American sitcom. Twenty-nine of those popular co-stars get all of the attention in this work. Each chapter focuses on one television character and the actor or actress who brought him or her to life, and provides critical analysis, biographical information and, in many instances, interviews with the actors and actresses themselves. It includes people like Art Carney of "The Honeymooners," DON KNOTTS and GEORGE LINDSSEY of "The Andy Griffith Show," Ted Knight of "The Mary Tyler Moore Show," Max Baer, Jr., of "The Beverly Hillbillies," Vivian Vance and William Frawley of "I Love Lucy," Ann B. Davis of "The Brady Bunch," Tim Conway of "The Carol Burnett Show," Jimmie Walker of "Good Times," Tom Poston of "Newhart" and Michael Richards of "Seinfeld," to name just a few. Besides Don Knotts and George Lindsey, other actors with TAGS connections include RONNIE SCHELL (for "Gomer Pyle, U.S.M.C.") and JAMIE FARR. * ABSOLUTELY THE BEST BY ANDY GRIFFITH (CD: $16.00) NEW! This CD (released in June 2002) features 13 of Andy Griffith's greatest comedy and music hits. Included in this compilation are "The Andy Griffith Theme," "Make Yourself Comfortable," "The Crawdad Song," "The Midnight Special," "Flop-Eared Mule," "What It Was, Was Football," "Romeo and Juliet," "Andy & Cleopatra," "Sourwood Mountain," "Cindy," "North Carolina, My Home State," "Mama Guitar" and "The Fishin' Hole." * PARABLES OF THE FISHIN' HOLE BIBLE STUDY SERIES. (Vol. 1 or Vol. 2: $88.00 each; Vol. 1 and 2 ordered together: $165.00) NEW! These professionally produced Bible study curricula draw on the lessons of Mayberry. We are all familiar with the parables in the Bible. But that's not the only place you'll find them. Parables are just short, simple stories that contain a moral message. PARABLES FROM THE FISHIN' HOLE provides several good examples to study. We've had a few price changes since the last "eBullet"-some up some down. One especially noteworthy price change is the popular "American Originals: Andy Griffith" music and comedy CD. It's now at a great new price of just $8.00 on cassette and $12.00 for CD. On August 16th, ANDY GRIFFITH participated in the dedication of the Virginia Dare Bridge across the Croatan Sound in Manteo, N.C. Andy was the first person to drive across the bridge. Passengers in his 1930s Packard were wife Cindi, North Carolina Governor Mike Easley, Mrs. Easley and North Carolina's Attorney General. Exactly two months later, on October 16th, the Griffiths, Gov. Easley and other dignitaries are scheduled to be on hand in Andy's hometown of Mount Airy to dedicate a stretch of U.S Hwy. 52 running from Mount Airy to the Virginia line as the ANDY GRIFFITH PARKWAY. In addition to the deserved accolade for Andy Griffith, the designation of the parkway in his honor is also an occasion of great pride and satisfaction for folks in the local community, throughout North Carolina and indeed among friends and admirers of Andy Griffith everywhere. In other news, the long-awaited film DADDY AND THEM is now set to premiere on cable TV's Showtime channel in 2003. DON KNOTTS made his annual trip back to West Virginia for his high school reunion. And several of his summer concert dates with Tim Conway had to be rescheduled for later this year because Tim was under the weather. RON HOWARD is not resting on his two Academy Award wins for "A Beautiful Mind" (now available on video and DVD). He's in the planning stages for his next producing project, a film about the Alamo (he decided not to also direct the film). His Imagine Films company also has several films being released this year for which he is executive producer. But Ron did take time for a big family vacation in June that also included father RANCE and brother CLINT HOWARD and their wives. Clint also appears in this summer's third Austin Powers film. Following a few performances during the first half of this year (including his traditional singing of "Back Home Again in Indiana" at the Indy 500), JIM NABORS has been taking it easy. But at least fans were able to tour his home and ranch in Hawaii on the special "TV Land Real Estate." The show premiered in May and will be rerun periodically. Other homes of stars will be featured in future specials, but it's neat that Jim was selected for the premiere. Jim'snext scheduled performance dates are his Christmas shows (another annual tradition for him) in Hawaii. GEORGE LINDSEY had a fun time performing with several Grand Ole Opry stars in Wabash, Ind., in early May. And he recently performed for private functions in Arkansas and North Carolina and at the City Lights Festival in Commerce, Ga., in addition to two Mayberry events. MAGGIE PETERSON MANCUSO has been doing movie location scouting work in Las Vegas for films, including one called "Stuey" about World Series of Poker champion Stu Unger. The Darling boys have been staying busy, too. DOUG DILLARD's legendary "The Classic Douglas Dillard Songbook of 5-String Banjo Tablatures" has been updated and re-released. It is considered one of (if not THE) best books ever written about playing the banjo. You can learn to play Darlings tunes (and more) just like Doug does. Doug also has been in the studio recording a couple of newly-penned Christmas songs. And Darling mandolin man DEAN WEBB is still working at the Mel Tillis Theatre in Branson, Mo., as well as performing with a bluegrass group six days a week on a river cruise boat called the "American Star." RODNEY DILLARD participated in the eagerly awaited "Will the Circle Be Unbroken 3" album with the Nitty Gritty Dirt Band and an all-star lineup of top singers. Rodney's contribution was the Mayberry favorite, "There Is a Time." The big news is that Rodney and his original co-writer MITCH JAYNE wrote a new verse, which will debut on the album, scheduled for an October release. And Rodney and Doug Dillard are going to be working some dates with the Nitty Gritty Dirt Band, and The Dillards are set to play Carnegie Hall in November! And that's not all. Mitch has been busy with free-lance writing, plus working as a writer and editor with wife Diana on the weekly "Shannon County Current Wave" newspaper in Missouri. BERNARD FOX has been carefully picking and choosing among prospects for film work. Most notable of the roles he passed on were for two offers for radio "shock jock" Howard Stern's film company. As Malcolm would say, "See here now." ELINOR DONAHUE has been doing some promotional work for TV Land in conjunction with the recent debut of "Father Knows Best" reruns on the cable channel. ELIZABETH MACRAE (one guest appearance on TAGS and best-known as Lou Ann Poovie on "Gomer Pyle, U.S.M.C.") had a wonderful run of sold-out performances in a production of "Picnic" in March at the Cape Fear Regional Theatre in Fayetteville, N.C.
JACKIE JOSEPH checked in with us all the way from England and again from Paris, where lately she has been spending much of her time. But even across Old Man Kelsey's Ocean, she's still filing reports for her regular "Talk with Jackie" column in "The Tolucan" newspaper back home. And she did make it back to her California home base long enough to make an appearance at the Hollywood Collectors Show in June. Other stars with TAGS connections at the June Collectors show were MAGGIE MANCUSO, RONNIE SCHELL, BARBARA STUART, JAMIE FARR, BARBARA EDEN and writer BRUCE HOWARD. Also filing an international report was JOY ELLISON (Mary Wiggins, Effie Muggins, Mary Scobey and other Mayberry kids), who shared her news from Prague, where she has been working as dialect coach on the film "The League of Extraordinary Gentlemen," starring Sean Connery. (She and most of the crew had to evacuate with the recent flooding.) She also recently did dialect work on the soon-to-be-released film "Chicago: The Musical," starring Catherine Zeta-Jones, Renée Zellweger and Richard Gere. MARGARET KERRY, whose appearance in two classic TAGS episodes ("Christmas Story" and "Andy Forecloses") have forever endeared her to Mayberry fans, is working on her memoirs, titled TINK TALKS, an allusion to her work as the real-life model for the animated Tinkerbell in Disney's "Peter Pan." DAL MCKENNON, who played sculptor Brian Jackson in "The Statue" (Episode #208), was a big hit at this year's "Lum & Abner" convention in Mena, Ark. That's our report for this edition. We'll have more news in our next issue. Though several people got multiple answers correct in this quiz, only one person submitted all the right answers: Stan Nicholson of Ash Flat, Ark. Congratulations to Stan, who wins his choice of any single item available online at Weaver's Dept. Store, except in the Collectibles section. 1. Andy and Barney both have their picture in the newspaper when they are saluted for having the lowest crime rate in the state. Barney's picture is also in the paper when he captures Tracy Crawford, when he's the hero in the cave rescue and when he's seen with starlet Teena Andrews. Floyd is seen in the paper when he "captures" the lady convicts and Howard Sprague gets his picture in the paper when he catches Old Sam. Congressman John Canfield's picture is in the paper when he returns to town. Helen Crump was in the Kansas City paper when working undercover on her thesis, though at the time she wasn't yet a Mayberrian. 2. Jim Lindsey performs "Rock 'n' Roll Rosie from Raleigh." 3. "Two Suspects Held on Fraud Charges" is seen as a headline in the newspaper that Barney looks through while he's observing Sheldon the Bully take Opie's milk money. 4. Howard Sprague tightens his shoe tree with 10 twists. 5. A "raccoon tail" and "huckleberry body" are used to describe a 1951 Ford convertible for sale in the newspaper when Barney is a Realtor. BONUS: Bob Rogers is "who's been messin' up the bulletin board." Miss Crump has some quick (and easy???) questions this time. The deadline for entries to be postmarked or e-mailed is October 15, 2002. The winner gets a choice of any item online at Weaver's, except for the Collectibles section. Good luck! 1. Name two middle names or initials for Bernard Fife. 2. What is said to be the most important crop in Mayberry? 3. Whose first two initials are said to be U. T.? 4. Who in Mayberry once intentionally jams his or her thumb into a chocolate cake? 5. Identify a time when "Santa Lucia" is sung in Mayberry. BONUS: Who in Mayberry is heard performing the song "Never Hit Your Grandma with a Great Big Stick"? At the end of May, there was the very successful BARNEY'S DAY OUT in North St. Paul, Minn., hosted by TAGSRWC's MICK KIEFFER and starring THE DILLARDS. Next up was the SECOND ANNUAL MAYBERRY SQUAD CAR NATIONALS in Brent, Ala., in mid-June. BETTY LYNN was Guest of Honor for the weekend, which was hosted by the City of Brent and the "Hearty Eatin' Men and Beautiful, Delicate Women" chapter of Tuscaloosa. The event included drag racing by six drivers in their Mayberry squad car replicas (see Chapter News for highlights). 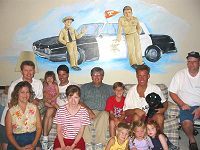 It's around this time of year that Mayberry fans begin to turn our full attention to Mayberry Days in Andy Griffith's hometown of Mount Airy, N.C. This year's 13th annual festival is Sept. 26 to 29. Confirmed TAGS stars so far include DOUG DILLARD and the Doug Dillard Band (featuring GINGER BOATWRIGHT), making their 13th appearance; BETTY LYNN; HOWARD MORRIS; MAGGIE MANCUSO; and GEORGE SPENCE. One or two additional stars are expected, but not yet confirmed. For the full Mayberry Days schedule and ticket info (for the portions of the weekend that require a ticket), check out the Surry Arts Council Web site at http://www.surryarts.org. Or to purchase tickets or for info, call (336) 786-7998. Or write to Surry Arts Council, P.O. Box 141, Mount Airy, NC 27030. There's something for everybody at Mayberry Days. From the golf tournament and banquet to the VW Boys and Doug Dillard Band concerts, from Neal Brower's lecture to autographs with the stars, from Elvis (Michael Hoover) to Floyd's Barbershop, from the trivia contest to a Snappy Lunch pork chop sandwich, from the parade to bowling and from horseshoes to barbecue, there's more to do at Mayberry Days than Mrs. Wiley can possibly keep track of (and don't forget about her annual Tea Party, too). Also, be sure to see the information at the top of this newsletter for details about a very special new Raffle and your chance to win an autographed Mayberry Squad Car Cookie Jar and, best of all, "Dinner for Two with the Stars at Andy Griffith's Childhood Homeplace." The Raffle is being conducted right now and the drawing will be on the Saturday of Mayberry Days. TAGSRWC members and chapters have been the driving forces behind all of this summer's Mayberry events. Nowhere was that more literally true than the Second Annual Mayberry Squad Car Nationals hosted by our "HEARTY EATIN' MEN AND BEAUTIFUL, DELICATE WOMEN" chapter (Tuscaloosa, Ala.). The winner of the prestigious drag-racing segment of the Nationals, was defending champ Kevin "Speed, Speed, Speed" Snead of the host chapter. He barely nipped "Checkpoint Chickie" in the finals. In other chapter news, Marsha and David Scheuermann of MAYBERRY TROOP #44 chapter (Clear Lake, Wis.) have broken ground on their dream home, an exact replica (inside and out) of the Taylors' house in Mayberry. They might take a few liberties with unseen portions of the home, but their attention to detail in the parts we're able to see is going to be a sight to behold. But one warning: Build it and we WILL come! JENSEN ORTHOPEDIC SHOES chapter (Cambridge, England) returned from Afghanistan and used TAGS tapes "as a way of decompressing after a tough few weeks in the scorpion-laden, viper-infested Afghan desert. And Gomer sure wouldn't like the spiders there. They're as big as the palm of your hand. Shazam!" Several chapters continue to publish outstanding chapter newsletters on a regular basis, including THE MAYBERRY UNDERCOVER AGENTS (Danville, Va.), MAYBERRY chapter (Knoxville, Tenn.), and "DOGGONE FIREFLY HIT ME, KNOCKED ME RIGHT DOWN" (Huntingburg, Ind.). Several of the chapters also post photos and news a their chapter Web sites. You can find links to them at http://www.tagsrwc.com. If your chapter has news to share, drop us a line and we'll try to get it in "The eBullet." We also expect that "The Pocket" will continue with additional issues for 2003 and 2004, but we do not yet have a schedule or subscription rate. We should have that information in the October "eBullet" and certainly in the November issue of "The Pocket" itself. The next issue of "The eBullet" is scheduled for the third week in October.